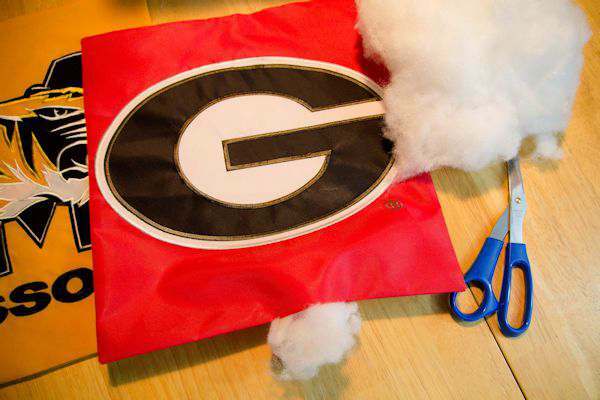 Learn how to repurpose garden flags into pillows to decorate your porch with for different times of the year. Hubby and I love to show our football spirit by showing what teams we each follow. Anyone who follows the SEC knows how serious football season is. Last year we made a pallet sign which shows we are a Divided House which we hang proudly in the Living Room during football season. I loved how that project turned out. 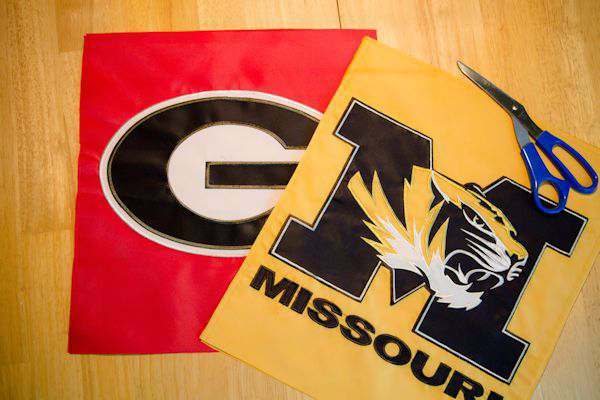 I was cleaning out some drawers a few weeks ago and found a couple of garden flags we use to hang outside during football season. Since I used my garden flag holders when we made the USA Pallet Garden Flag this past summer, I didn’t want those nice garden flags to go to waste. I had to display them proudly somehow and figure out a way to repurpose them. I decided to turn those garden flags into pillows. It just so happened that those garden flags were two separate sides sewn together which was going to make this project super easy to make. You could actually do this project with two different garden flags and turn them around for the occasion. Ex: A Christmas and Thanksgiving flag made into a pillow. 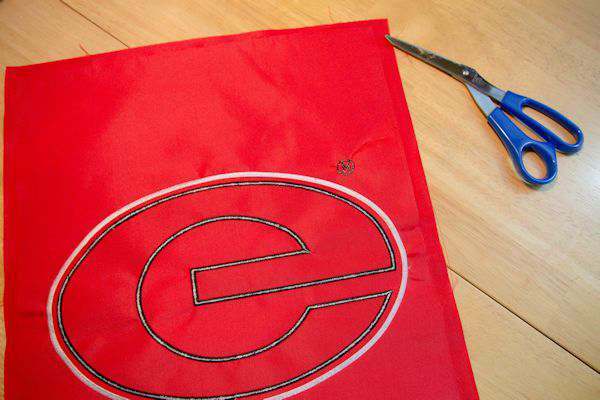 The garden flags are made from nice thick nylon which is perfect for outdoors. It feels like parachute material. First thing I did was to rip out all the seams with the seam ripper. This does take a bit of time, but prep work for any project does. With both flags apart, I next ironed flat all the old seams so it would look nice and neat. I laid both sides of the flags on top of each other because one side was larger than the other and matched up the logos. I used a few pins to hold the flags still while I cut the edges so the flags would be the same size. 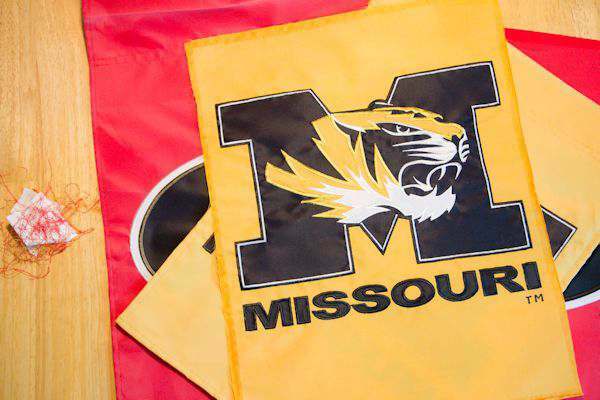 Both flags are now the same size and ready to sew. Put the RIGHT sides together and match the logo where they are laying on top of each other. 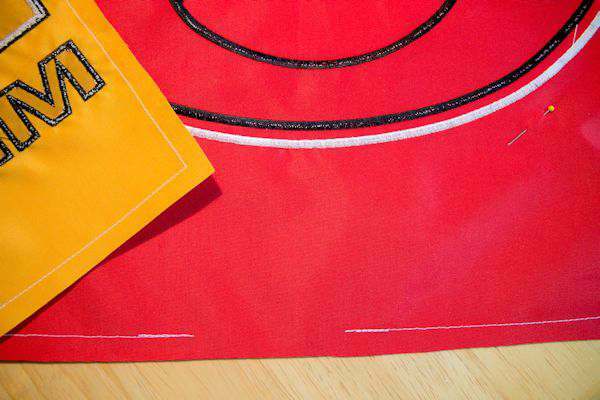 Then take a few pins to keep the two pieces from sliding around while you sew. 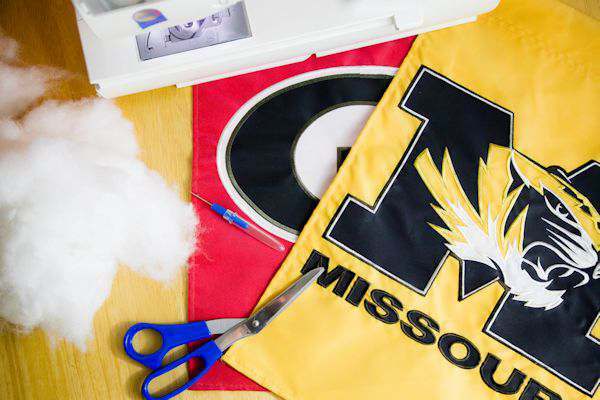 Start at the bottom of the flags and sew all the way around. You will leave about a 3 inch or so opening (depending on the size of your pillow) at the bottom. Notice I did a back stitch where I started and ended my stitching. This will keep your stitches from coming apart while you pull the pillow right side out and also while you stuff the pillow. Your seam width will depend on where your logo is located. My seam was about 1/2″ all the way around. NOTE: I normally would use thread the same color as the material, but used white for demonstration purposes so you could see my stitching. Cut the corners as demonstrated at the top. This will give the corners a nice point when you turn your pillow inside out. 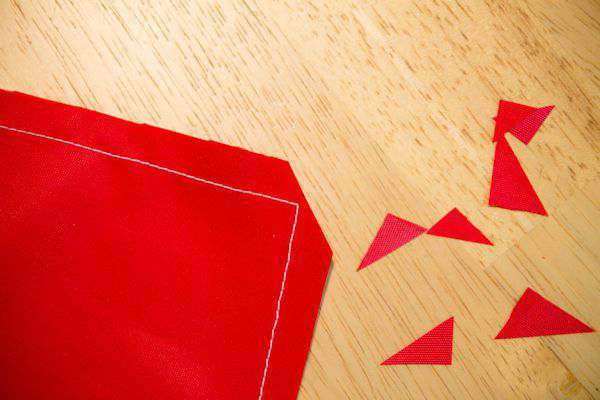 Also, cut around the seams to make them nice and even and not really wide. Pulling the pillow inside out is a bit of a trick. I pushed the top of the pillow through the hole and just slowly started to push/pull the rest of the pillow until it all comes out. 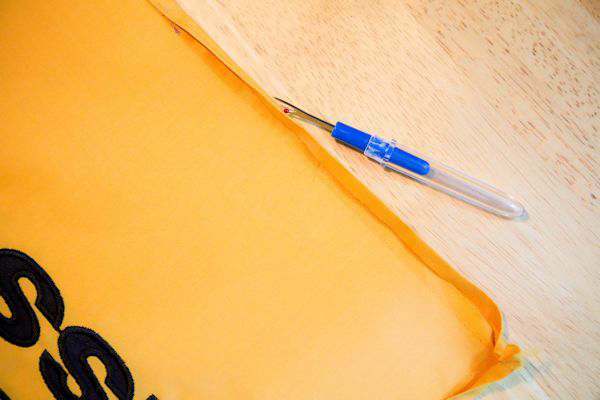 Take your point turner and carefully insert the pointed end inside the pillow to push out the corners of the pillow. After pulling the pillow inside out, I ironed it flat to get out the wrinkles from turning it inside out. Now you can start stuffing the pillow. How much you stuff it, is up to you. 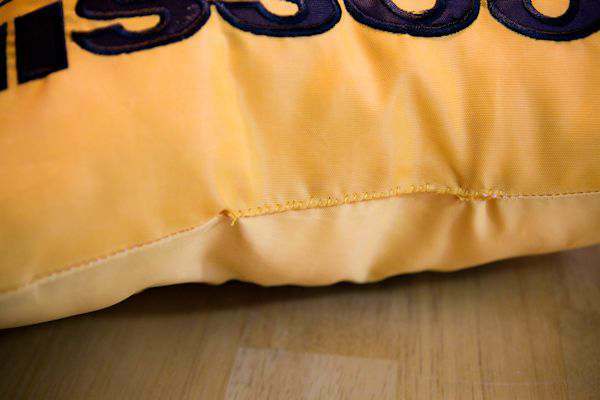 If you get it too “stuffed” it will be harder to sew the hole up at the bottom of the pillow. NOTE: I had a really large stuffed pillow that came with my couch that I have never used and kept it just for this occasion of needing stuffing for pillows I make. Stuffing can be rather expensive, so if you see decorative pillows cheap, buy them for just this purpose. After stuffing comes the time of closing up the hole. You will have to hand stitch this which is usually done with a blind stitch. But because of the material in the flags, I wasn’t able to do a blind stitch. So, even though you can see my stitches, its on the bottom of the pillow where no one will see it anyway. Now they proudly sit on my front porch and not sitting in a drawer getting older. I love how they turned out! I can’t wait to make other pillows with garden flags. Pretty cool craft idea. I am a pillowaholic. I love these pillows. Thank you Stephanie for stopping by. I love pillows too. Easy way to decorate. Oh yes. Please try it. There are some cute garden flags out there just laying around. I love it! We’ll need to do something like this too as we love a few different football and hockey teams. I love to repurpose items. I get more use out of them and create a unique treasure. Seems I am repurposing more and more in my life. Thanks for stopping by. Those turned put so cute. I should make some new pillows for our couch. I am just afraid that the dog will take them over. They did that the last time my husband had throw pillows on the couch. 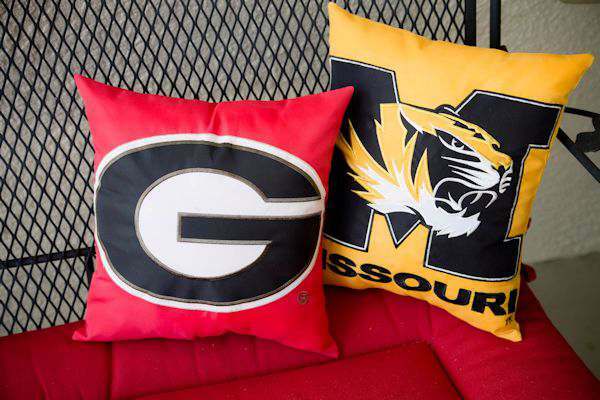 This is a great idea to change garden flags into pillows. I love this idea and they are easy to make too. They would actually make for great gift ideas. Thanks for sharing the idea and instructions. You are so talented! I love pillows too, although my husband just does not get it. I need to get my sewing machine out and have a go! Oh thanks! I haven’t used my sewing machine in so many years and one day I decided to fix something and realized how much I enjoyed sewing. That was a great craft idea! The next time I see some garden flags on sale I’m going to have to pick them up now. As for our house, we’re a house divided as well, my husband is a SC Gamecock fan while I’m a LSU fan. HI Cassie. You DO have a divided house too!! Good luck this season. Hubby and I enjoy watching LSU too. Wow! I love the idea of re-purposing things like this. They look great as pillows! What a great little project! They would make awesome outdoor pillows and they look absolutely fantastic! That is so awesome! I love how you turned the flags into those pillows, they came out great! Throw pillows are the first sewing project I ever did. I love this idea and I have a few garden flags to use for this project. This is such a great craft ! This is the prefect birthday gift for my bother in-law, thanks for sharing now I’m done looking for ideas. Thank Jennifer for stopping by. These would make great gifts. Those are so adorable. You are so crafty and they look really great on the chair.